This is a multi-functional product with features of air mouse, remotecontrol, and wireless keyboard. Adopts 2.4G wireless transmission technology,and its operating range can up to 10m. Its mini size allows user to grip itfirmly and its typical remote control shaped appearance makes it effortless andcomfortable to use. 3 in 1 functions: A perfect combination of air mouse, wireless keyboard andremote control. 2.4G wireless connection to provide stable and accurate transmission rate, andits operating range can up to 10m. Air mouse function, which will convert the space movement in the air into anaccurate displacement on the screen. Keyboard function and its QWERTY full keyboard design will help you type fast. 3-Gyro+3-Gsensor, so you can control it in horizontal and vertical mode. 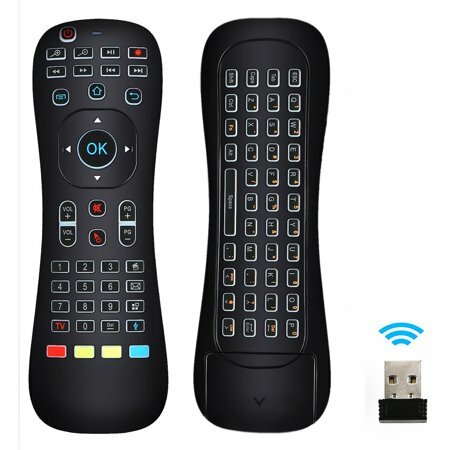 Supports IR learning function: It can learn the code values from TV remote, andyou can control your TV just with this air mouse. With LED backlit effect, so you can easily use it in the dark night. Built-in wireless microphone, and user can use it for chatting orrecording，supports voice function). Ergonomic design and it will provide user comfortable hand feeling during usingprocess. Mini and exquisite design, handheld size, helping user to grip it firmly whenusing. Plug and play, easy to operate. Suitable for Android TV box/PC/smartTV/Set-top-box, etc. 3 in 1 functions: A perfect combination of air mouse, wireless keyboard and remote control. 2.4G wireless connection to provide stable and accurate transmission rate, and its operating range can up to 10m. Air mouse function, which will convert the space movement in the air into an accurate displacement on the screen.